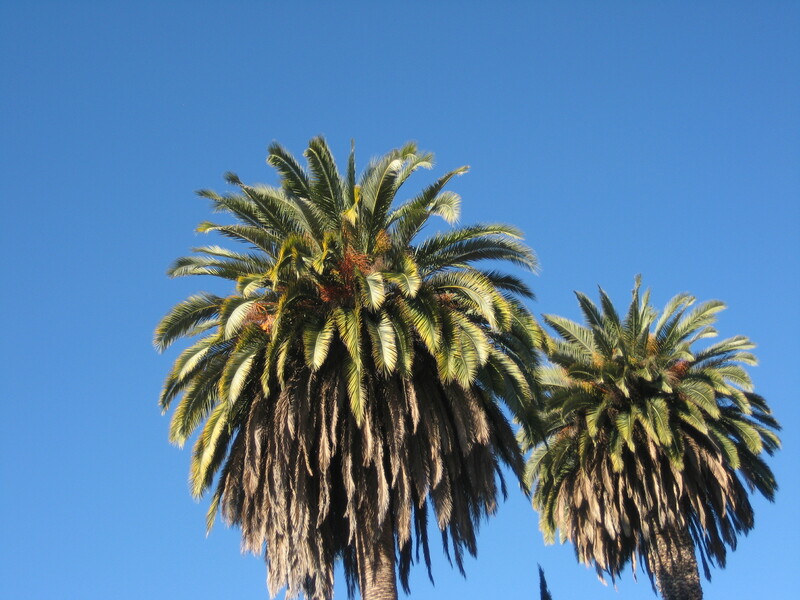 Reading palms | Real in L.A. These are the palm trees that I see from my second-story study. They are my anemometer: before leaving the house, I look at the fronds to determine how strong the wind is, using my own version of the Beaufort scale. It’s not as if I actually know anything about the Beaufort scale; I stumbled across the subject just today while trying to find out how to spell ‘anemometer.’ But it suits my purposes: it’s a visual method of determining relative wind force that was devised by a 19th century British Royal Navy admiral named Beaufort. Seamen learned to eyeball wave height, white caps, and water spray and to assign the conditions a numerical rating from 1 (calm) to 12 (a helluva gale you wouldn’t want to be out in). There are concomitant land-based observations that rely upon smoke, flags, roof tiles, and, yes, tree limbs, among other markers. The Royal Navy used these gradients to determine how to position the sails of their ships. I have much humbler intentions: I just want to know how many layers to wear when I go outside. You are currently reading Reading palms at Real in L.A..